I’m getting pretty tired of writing about vegetables–don’t think I’ll even mention the word until this time next year. You must be getting enough of it as well! Never worry, only three days of Boot Camp left–I guess we know why they used that analogy for these lessons. Today’s topic: Growing Greens. Now I admit, I don’t love salad greens. I sort of have to force myself to eat them, because my favourite use is in sandwiches, but then I only use a few leaves of greens, and a lot of other, often calorific, sandwich fixings. But I always hope “I’ll do better next time”, so here I am, growing greens again. 1. They tolerate lower light levels. 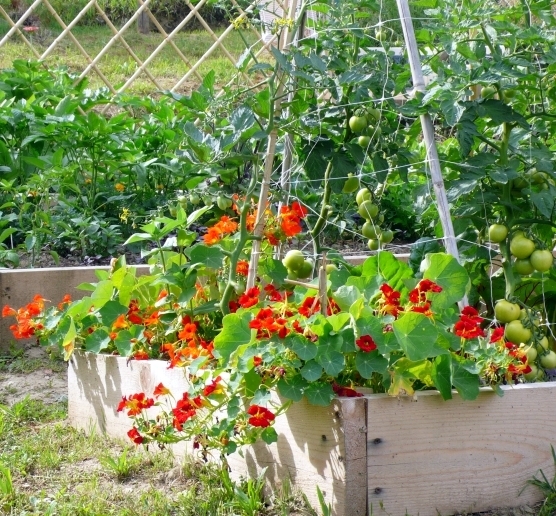 You can plant them in an already slightly shady (still getting a few hours of direct sun) areas, or in the shade of plants that will grow tall in mid-summer–like your tomatoes, potatoes, peppers. 2. They’re often quite decorative so they’ll do well in your ornamental garden. As you harvest the outer leaves, (leaving the centre to continue producing), you’ll want to have other plants growing around to hide the bare stem. 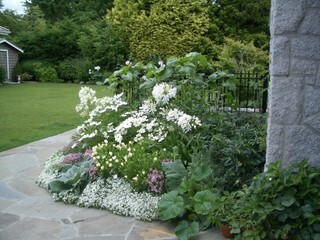 Annual Alyssum is brilliant for that. Sow the flower seeds at the same time you sow the greens seeds or at the same time you transplant the seedlings. 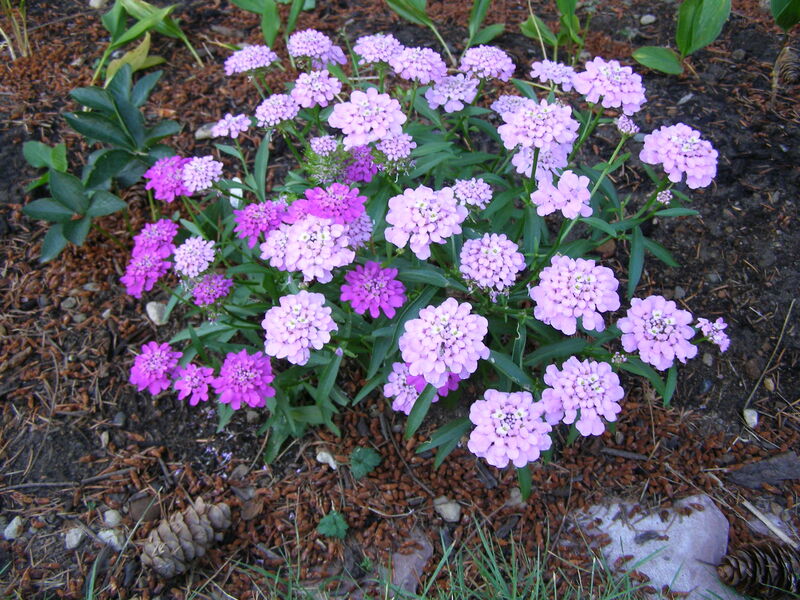 Ditto for candytuft (Iberis umbellata). 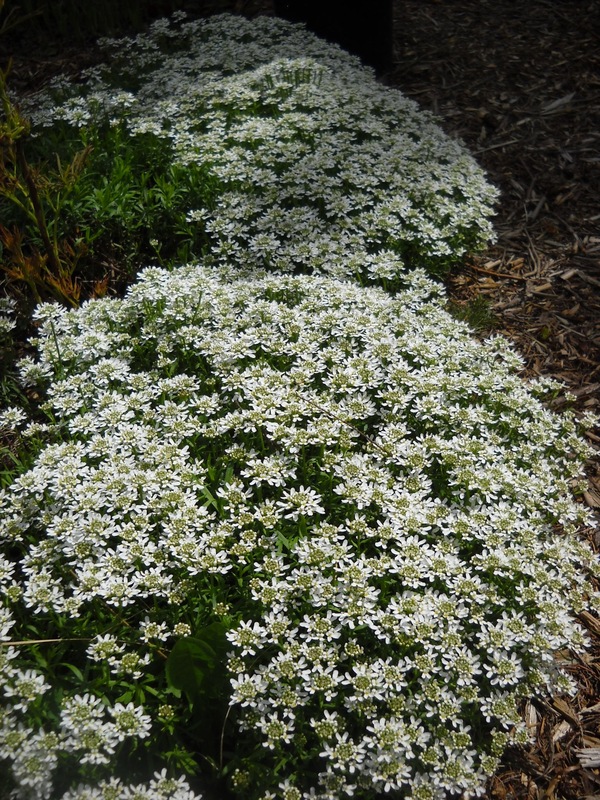 Iberis umbellata–annual candytuft. 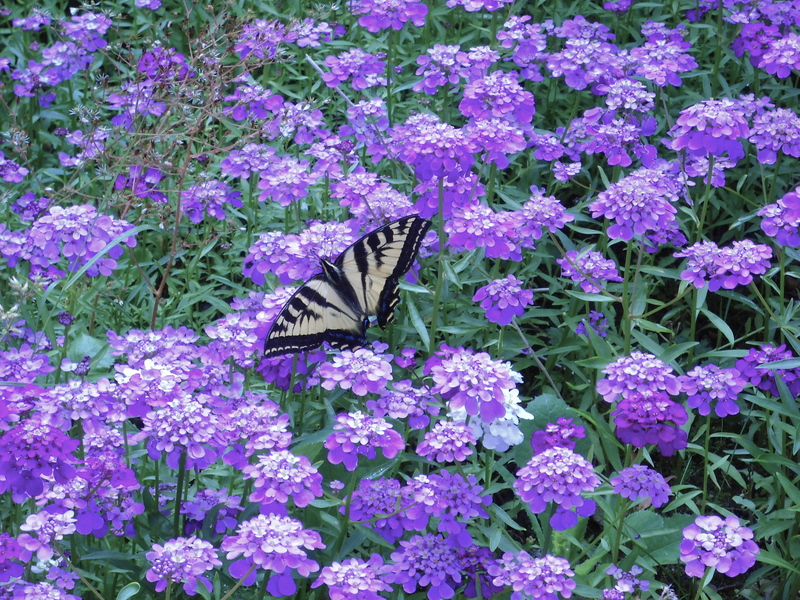 And yes, you get multi-colours, and it self seeds like crazy–but in a good way. Like alyssum, very easy to thin. 3. Some greens are hard to keep growing through the hot days of summer, but collard greens and mustard greens will put up with a lot of heat. The other “green” I love to put in my sandwiches, and to a lesser extent in salads, is nasturtium leaves. They’re very like arugula in flavour, but with less bitterness, and thicker–more substantial. And nasturtiums are great additions to the vegetable garden, since not only are their leaves edible, but the flowers are sweet and peppery. Beautiful in a salad. They are said to be a great “companion” plant for the vegetable garden, altho’ I don’t care for one of it’s uses–as an aphid trap: the nasturtium attracts aphids drawing them away from other aphid-susceptible plants. However it’s my understanding that aphids (there are bazillions of species) are specific to the plant they are infesting, so the ones on the nasturtiums are not the ones that will attack cabbages, or roses, or daisies. One thing they definitely do do is attract pollinators, so planting them around plants that need pollination in order to produce fruit–toms, cukes, squash etc.–will be a very good thing. Two days left–herb garden and growing tomatoes. Stay tuned. According to colour theory, white conveys purity, cleanliness, safety, wholeness, perfection. That’s not my own idea, you’ll find it in just about every resource about colour. (Including this interesting one about “white in ‘Breaking Bad'”!) 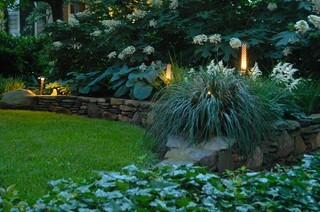 White will glow in low light situations, like your shade garden, or in the evening. 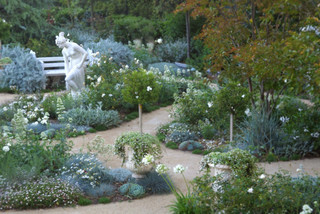 It also conveys a sense of restfulness, so while other gardens encourage you to get in there and play, or work, or DO something, the white garden wants you to sit, read a book, have a glass of wine, REST. A disclaimer to start with: none of the pictures included here are my own, since I don’t have a white garden myself. I’ve said this often before: layer your garden with trees, shrubs, tallish perennials (or annuals for that matter) and low growing ground covers. (It shouldn’t look like stadium seating– remember, you’re viewing the garden from lots of different angles.) 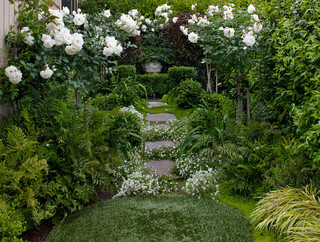 The white garden is no exception, in fact will need layering even more. Vines will give a variant on the taller shrubs. Evergreen Clematis armandii blooms in late winter and will climb as high as there is something to climb on. Ditto for climbing Hydrangea petiolaris. The latter needs something REALLY strong to hold it. Like a brick chimney, or a tree. I recently designed a garden with Hydrangea petiolaris climbing a very large, very dead old cedar that the owners were unwilling to pay exhorbitantly to have removed. Any garden needs a combination of textures. 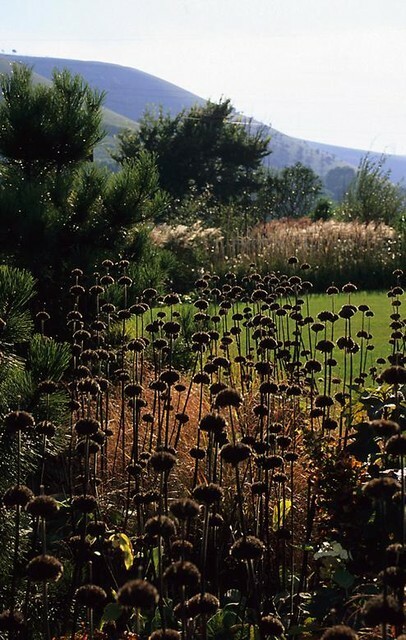 Spikey (Acanthus, Yucca, New Zealand Flax), soft and fluffy (Baby’s Breath–Gypsophila, wonderfully fragrant Alyssum), grassy (Miscanthus sinensis, as below, or Mexican Feather Grass–Stipa tenuissima), bold–large leaf Hosta, Rodgersia, Rhodo. Two plants next to each other that have similar leaf shape sort of meld into one, even if the leaf colour is different (unless they’re very different, like the dark copper of Ninebark (Physocarpus), and the gold/chartreuse of Spirea). But put a bold leaf Hosta next to an ornamental grass or Baby’s Breath or the Spirea, and you’ve got the beginnings of a dynamite combination. 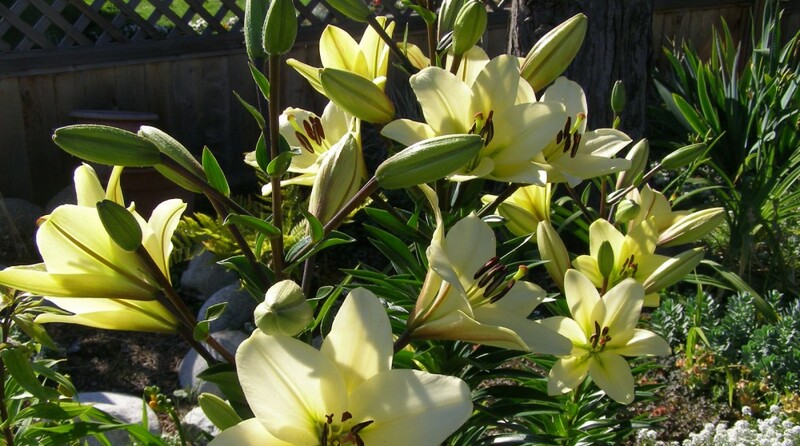 Choose plants that will bloom at different times in the year. Of course, starting with spring bulbs–snowdrops, then crocuses (croci? ), tulips, alliums. Then move on to early perennials like Iberis sempervirens (perennial Candytuft), white Columbine (Aquilega), white creeping Phlox subulata. White flowering shrubs can take the place of one or another season of whites: Azalea blooms mid-spring, Philadelphus and Deutzia mid-late spring, Hydrangea early to mid summer. 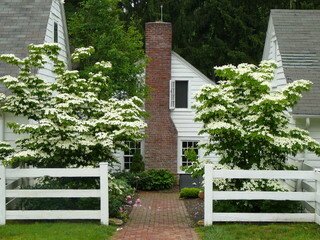 And don’t forget trees–Cornus (Dogwood) ‘Eddie’s White Wonder’ in late spring, Oxydendron (Sourwood) in late summer. I don’t have to list every possibility–you’ll have the idea now. The garden above, almost completely bordered by hydrangea, will look a little tatty in late summer/fall as the white blooms turn to brown. A white garden might require a little more diligent deadheading than a mixed colour garden, simply because the faded white blooms sometimes look less attractive that other colours. 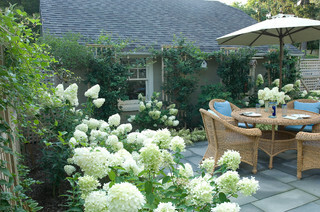 One of the things you usually see in white gardens is a fairly formal style. It doesn’t have to be that way, but white and green lends itself to a formal feel. White roses will complement the formal style–as long as it is highly disease-resistant. Check rose suppliers in your own area for roses that will work for you. 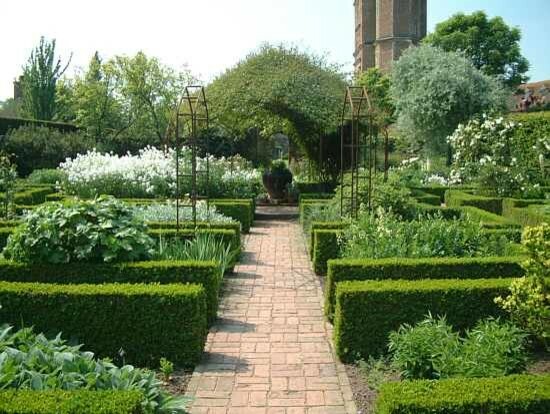 The Sissinghurst White Garden below started in the 30’s as a white rose garden. If formal isn’t your cup of tea, but you still want soothing effect of the white palette, a simple solution is to just have non-formal shaped beds. 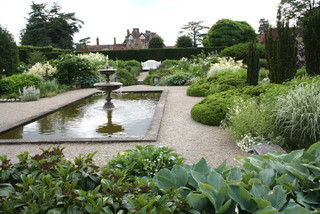 Formal beds would be symmetrical, very geometric, usually square, and often surrounded by boxwood or another clipped hedge. Changing up any of those elements would “casualize” the aesthetic. Unless your house is very linear (think Frank Lloyd Wright), square, or “Arts and Crafts” style, most other houses, with or without curvy lines in the roof, porch or other, will easily accept curved planting beds. That feature itself will instantly eliminate that rigid formality. No straight lines means the borders will vary in width and depth, which means they’ll also vary in how the plants–even the same plants as in a formal design–are located. I’d love to hear from you if you’ve tried a white garden. What has worked best for you? What suggestions do you have to add to this? What would you do differently? Always happy to hear comments.